West Windsor, N.J. -- On Aug. 22, Mercer County Community College hosted a delegation of 15 teaching faculty, accompanied by an interpreter, from Zhejiang College of Construction, a vocational school in Hangzhou, China. According to MCCC’s Global Education Director, Andrea Lynch, the group is spending two weeks in the United States learning about the community college system in order to improve their vocational school model. The first stop was Mercer’s Engineering Technology Building, where faculty members Dom Defino and Harry Bittner discussed the Electronics Engineering program and showed the group Mercer’s brand new 3-D printers. Other academic programs highlighted during the tour were Architecture with Professor Garry Perryman and Engineering Technology with Associate Professor Jim Maccariella. Savita Bambrohlia discussed the admissions process, particularly as related to international students. 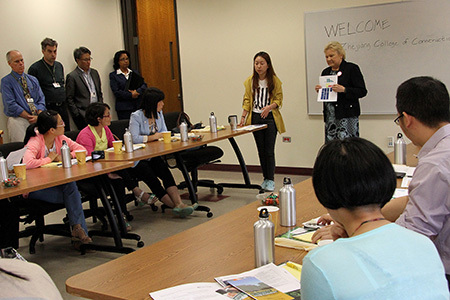 The group’s final stop was the West Windsor campus Administration Building, where the Chinese instructors met with MCCC President Patricia C. Donohue, who explained the U.S. system for K-12 public education and Higher Education. Community colleges, she said, provide the greatest opportunity for those seeking a college degree or workforce training. The Chinese guests also spent time at Brookdale Community College and Ocean County College, and will take in other sights including a visit to the Jersey shore, New York City and Washington, D.C. In addition to Professor Lynch, MCCC faculty member MeiMei Gao, who teaches Computer Science and speaks fluent Mandarin Chinese, accompanied the delegation around campus, as well as Janice M. St. C. Thomas, Ph.D. , Director of the International Education Center at Brookdale Community College. 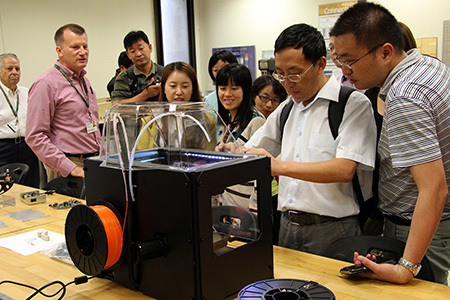 Faculty member Harry Bittner, left, in the Advanced Manufacturing Lab, during a demonstration of the program's new 3-D printers. With the assistance of an interpreter, MCCC President Patricia C. Donohue explained the American education system and the important role of community colleges.